My mother had a birthday last week. She’s had quite a few birthdays, but she is far from old. She can outwork me, but she hasn’t been able to outwit me in a long time. Of course, that’s just my opinion. She might not agree. I don’t know about you, but my parents weren’t perfect. And they’re continuing in that vein as we grow older. But they did the best they knew how with what they had. And with what my brother and I gave back, I suppose. We need to try to be the best parent we can be with our kids. And we need to understand we’ll never be perfect. Nor will we have perfect children. Any of us. I don’t care what you tell the teacher, your child (and mine) can be a poot. Any day. Quit letting your kids be little pigs. Have them wash their hands. Yuck. Cripes, we have running water nowadays. We have no excuse. Talking to mama about a house we read about that had a dozen bedrooms and 24 bathrooms, we were aghast. That means a separate bathroom for each person if there were two people in each bedroom. Crazy. And mama’s husband says, “I have to wait for you all the time to use the bathroom and there’s just two of us.” Really? Go to the downstairs bathroom and quit complaining. Then mama says, “We had four people and no bathroom. Or running water.” OK, you win. She does still outwit me. Dang. Let’s work at not being so stupid. Read a book. Learn something new every day. Share it and you’ll have smarter friends, too. Quit spending time with friends that talk about the same thing every time. Or make a pact to get past there. Crawl up out of the gutter. We all should. “If you are always trying to be normal, you will never know how amazing you can be.” Maya Angelou wrote those words. You should learn something about the horrific things that happened to this amazing and revered woman. It will make you appreciate your life more. There are several things approaching the amazingly appreciated in my world this week. Linda Hill Crop Insurance is appreciated for her sponsorship of the Guymon Farmers Market. And each Saturday morning I see people loving the market. They probably appreciate Linda Hill and her staff, too. Well, except for Markie Kidwell who got there too late on Saturday to get a loaf of Reyna’s jalapeno cheese beer bread. Sorry Markie. Lots of people seem to appreciate Reyna’s bread! And Main Street Guymon has their first child daycare member! Children’s Garden Daycare has joined and we all appreciate Shaunda Williams and her people. Even the kids. And kids sometimes are harder to appreciate. Well, for me. Probably not for Shaunda. If you’re interested, they are remodeling the daycare and they currently have some positions open for kids. They also accept drop – ins for all you moms that are trying to be better moms. 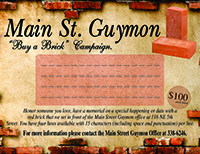 “We are fun,” Shaunda said to me in an email, “LOVE kids, and want to provide a home – like atmosphere.” I’m proud they’re part of Main Street Guymon. Don’t miss the Healthy Moment on Thursday, July 24, at Play Like A Girl Gym from 5 – 6 pm. There will be healthy snacks, blood pressure checks, a demonstration from Play Like A Girl, plants and herbs from Mary Long (gardening is healthy and so is the Farmers Market where Mary Long is each Saturday morning). You also come by and will have a chance to win $100 in the drawing at 6! Be there. We would love to see you. See you on the bricks. Appreciate all you do for our community, too!